The blues giveth, and the blues taketh away. 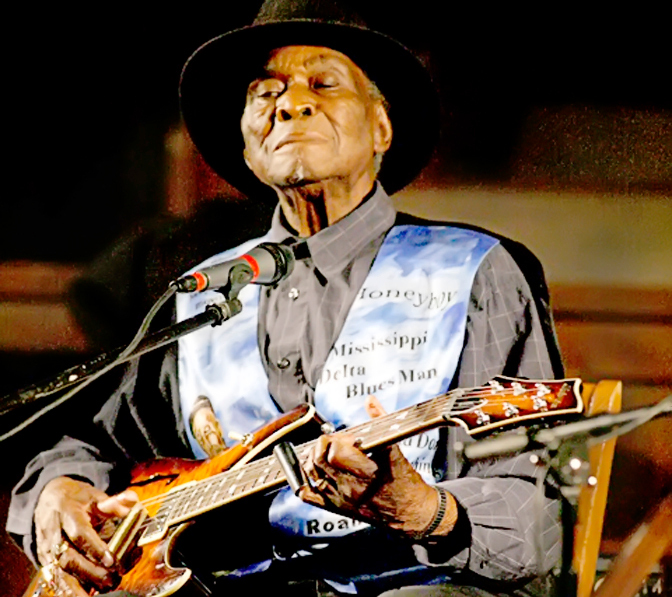 David “Honeyboy” Edwards, one of the last of the old-time Mississippi Delta blues players, passed on August 29, 2011 at the age of 96. He worked on the road, playing through this year, until ill health finally forced him to slow down and officially retire—last month. Born in 1914 in Shaw, Mississippi, Edwards was a contemporary of Robert Johnson‘s, as well as a friend. He maintained that he was with Johnson on the night the legendary bluesman sipped from the poison bottle that would be the death of him, fueling the myth and legend with some actual fact. Edwards of course had his own style and sound too; I was at once honored and humbled to have seen him perform his slip ‘n’ slide renditions more than once in Southern California, where he appeared frequently in his final years. Mercifully, not only was he recorded aplenty, his story was documented in 1997 in his epic blues tale, The World Don’t Owe Me Nothing, a must-read for blues and rock ‘n’ roll devotees, and anyone interested in the music and lives of rural musicians in the pre-Civil Rights South. “The blues is something that leads you,” he wrote. “You got to go where it leads you.” Deepest condolences to his family, friends, fellow musicians, and many admirers, as Mr. Edwards rambles on to rest in peace.